Frau Franz » » Comic+Riso Workshop in Berlin! 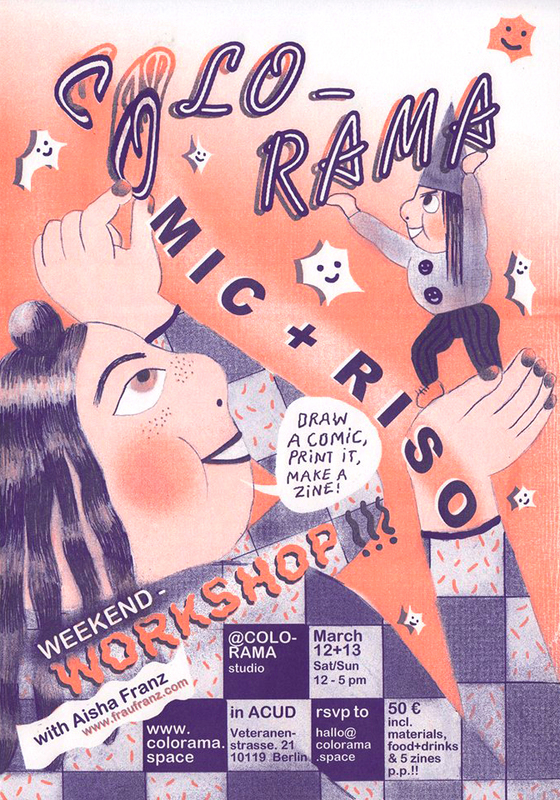 Aisha Franz und Colorama invite you to a Comic-Riso-Workshop. We want to make a collection of mini comics with you. Starting with a short introduction into riso-printing and examples of comics and zines we will quickly continue to find a theme and develop the storytelling for each individual comic. We will work with two colours and cut and bind the little zines together so everyone can take them home immediately. March 12.-13. (Sat+Sun) / 12 – 5 pm / max. 10 participants /50€: 5 zines p.P, material, food and drinks included.